Unfortunately, many patients are given a diagnosis of sleep apnea without ever having their airway examined. Oftentimes, structural abnormalities (deviated septum, nasal polyps, enlarged tonsils, airway tumors, vocal fold disorders, GERD) go unrecognized and untreated. At our ENT center, we consider an airway examination a critical part of the diagnosis and treatment of sleep apnea. When you arrive for your consultation, give your ENT doctor as much information as possible including a record or journal of your sleep habits, i.e., do you snore, do you notice pauses in your breathing, do you choke or gasp during the night, and how often? If you don’t know, then perhaps your bed partner can assist. In addition, let your ENT doctor know if you’re tired throughout a typical day, if you experience morning headaches, night sweats, sexual dysfunction, inattentiveness, problems remembering things you should remember, anxiety, depression, or irritability. Bring a list of all medications that you’re taking to your appointment – both prescribed and OTC. And don’t forget to call your medical insurance provider and ask if you need a referral for your ENT doctor visit. A sleep study is the most common method of diagnosing sleep apnea (and its severity) and can be performed in your home or overnight at a sleep center. Frequently, patients choose home sleep studies as this test is more affordable and convenient. There are a number of ways to treat sleep apnea. The continuous positive airway pressure device, or CPAP, is the most well-known and highly-effective method for treating sleep apnea. It is typically the first line of treatment. It contains a nasal or full-face mask, a long hose, and a powered motor. A humidifier that adds moisture to the air intake is optional. If you suffer from obstructive sleep apnea, or OSA, your throat muscles and tongue collapse into your airway which disrupts breathing. The CPAP blows pressurized air through your airway preventing it from collapsing as you breathe throughout the night. By using the CPAP machine, you should notice no or fewer breath-stopping episodes, less snoring, less fatigue during the day, less anxiety, lowered blood pressure, and a lowered risk of heart disease. The CPAP has come a long way since it was first invented in 1980 by Professor Colin Sullivan at the sleep clinic of the Royal Prince Alfred Hospital in Sydney, Australia. The first iteration was big, bulky, and noisy – just like the first computers. And like computers of today, modern CPAPs are much smaller. They leverage computer chip technology, weigh less than one pound, and fit in your hand. Due to integrated battery systems, they are also portable. They are built with proprietary breathing algorithms which can deliver more effective, lower rates of pressure, and are equipped with Bluetooth™ technology to sync with your smartphone thus allowing data to be shared with your doctor. A custom-fit oral appliance that looks and fits like a retainer or sports mouthguard. It pushes the lower jaw forward which helps to keep your airway open. If your ENT doctor recommends an oral appliance, a prescription will be written for you to take to your dentist who will mold one for you. Oral appliances for sleep apnea are covered by a host of medical insurance providers. The benefits of an oral appliance to treat sleep apnea include comfort, convenience, ease of wear and maintenance, and portability. 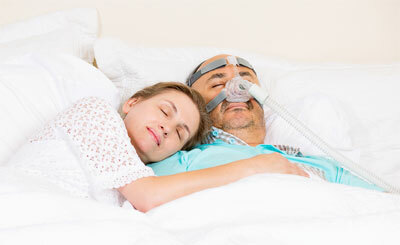 Some patients find it difficult to adhere to the CPAP regimen which prompts them to seek alternate treatments. Upper airway surgery is one such treatment which removes tissue in the airway. Septoplasty – bone or cartilage is removed until the nasal passage is large enough to allow for normal, comfortable breathing patterns. Turbinectomy – Removal of some or all of the turbinate bones in the nasal passage. Swollen or inflamed nasal turbinates can cause breathing issues. RadioFrequency ablation (RF) of the turbinates – reduces the amount of turbinate tissue which opens more of your nasal passages and allows for easier breathing. RadioFrequency of the soft palate with adenotonsillectomy. Maxillo-mandibular advancement – advances the soft palate, tongue, and suprahyoid musculature attached to the maxilla, mandible and hyoid bones. Tracheostomy – for severe OSA, an incision is made in the windpipe which bypasses the collapsed throat muscles and tongue that are obstructing breathing. With a disposable valve covering the nostrils, the EPAP forces positive pressure only when you are exhaling. Consult with your ENT doctors if they believe that your airway is collapsing only when you are breathing out. A stimulation device, similar to a pacemaker, is implanted in the chest and will stimulate the hypoglossal nerve (which controls tongue movement) to open your airway. It monitors your breathing and is only activated while you sleep. If you would like to know more about snoring and sleep apnea, we invite you to call us at (610) 279-7878, book an appointment online, or visit The Pennsylvania Snoring & Sleep Institute.